Well, shouldn’t we? Everything happens for a purpose. Your purpose is to find the best speaker stand for your stereo system or home theater and our purpose is to help you attain that goal. And that’s why we’ve put a list of top ten speaker stands of current market. Choose the one that’ll suit you the most and cross out another box from your check list. Also, don’t forget to take a quick look at our stand purchasing guide and other few information that have been included for the perfect purchase. In this big market, you’ll get lost easily in the river of faulty products if you don’t have any experience in this field. Well, you can protest at this point. Yeah, this can be your first time purchasing speaker stands and surely you don’t have any experience then. Okay, that doesn’t matter. If you don’t have any experience, we’ll give you some tips. And this is exactly why we have a buying guide below. Follow the steps and gain enough experience! Yes, this is the first thing to consider before buying. In fact, this rule isn’t applicable for speaker stands only, it’s needed for everything you buy. A speaker stand comes with lots of benefits. It helps in eliminating annoying vibration caused by suppressed driver. Boosts bass quality. Saves extra space required for speaker placement. Gives speaker protection. Yes, it does have plenty of utilities. But the utility varies with models since the features are modified in different pieces. So, fix your target first. Decide why you need the stand for. This will help you to choose your speaker faster and will save the stress of strolling through bunch of gibberish stands. It’s better not to fix budget in this case. The price varies for different models. You may have to consider spending random amount to bag a worthy deal. It’s a step that cannot be avoided at ANY COST! You have to be very careful about the construction while choosing the stand. Why do you need a stand for? To provide the speaker with a firm support, right? To give that support, it has to be strong and sturdy. That’s why the construction matters a lot. And materials, of course. Because materials, alongside the construction, ensures a stand’s durability. The stands are usually made of metal or wood. The metal stands tend to last longer. Also see if the stand is built with compact and good materials. A good height is important to bring the speaker at a decent hearing level. 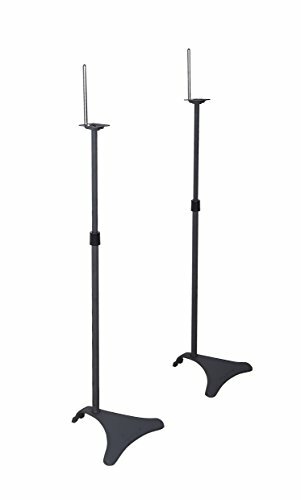 Some speaker stands’ heights are adjustable, some are built with non-adjustable pole. If the height is satisfying enough, it doesn’t matter if it’s not adjustable. A speaker stand basically consists of three parts: top shelf, pole and bottom shelf/base. Make sure that the speaker stand you’re rooting for has these parts built fairly. If the stand’s pole is hollow, it should be filled with sand. This technique helps in boosting sound quality. The stand should have a good arrangement for managing wire. From threading to running through the stand, make sure that everything works systematically. Purchase a speaker that features helpful facilities for wire management. Another thing that can’t be AVOIDED either! I mean, the stand is for supporting the speaker. So, the setup is indeed an inevitable part of this system. Check if the stand includes a convenient setup system. Well, you can know about the features from manual, page details and product review. Since you’re shopping online, you have to rely on product review (and that’s what you’ll find below: Our top 10 speaker stands reviews) to understand the features. The features describe the speaker stand’s capacity. Learning the features is very important in order to know if the stand is gonna meet your requirement or not. Does It Meet Your Need? After learning the features and specs, it’s time to come to the conclusion. As we mentioned earlier, features depict the item’s quality. If it holds the features that you’ve been looking for all along, perhaps this stand is the one for you. Sometimes the feature description isn’t enough to recognize a quality product. In this case, the wisest initiative is to read the customer reviews. You can find them on the seller website. The customer’s feedback will give you a good sight of the item you’re dealing with. Now after completing all the steps above and selecting your stand, it’s time to confirm the order and purchase. Be careful about the purchase in order to avoid unpleasant mistakes. It’s better if the product includes a warranty, this will come handy later. Also, make sure that the stand comes with a return policy in case they send you a faulty one. Brand or company is not essential in every case. A good speaker stand can be originated from any company, the whole thing depends on the materials and construction method. However, some company names do come forward whenever you’re looking for suggestions and there’s a legit reason for that. Every company starts with the intention of producing the best product and that’s what they try to reflect through every item. In this rush, some products become very popular in customer’s eyes and to keep this popularity going, companies keep working on more stuffs like that and that’s how they become renowned. And one more thing, customers are always attracted to quality goods. So when a name becomes popular, it’s pretty evident that consumers find their products satisfying. That’s why people go for the popular brands first. But that doesn’t always help to detect the product’s quality. A fantastic speaker stand can be manufactured by a least known company as well. So you must judge all the speaker stand individually, not by their names only. Well, you want the best speaker stand for your system. Because this is what everybody wants, to own the best item of the market. How did we know that these ten are some of the best stands? Or put in simpler words, how did we sort them out? One of the many reasons for using the speaker stand is this: let the sound be delivered like it was supposed to. When the speaker is directly placed over a surface, specially a floor, it fails to deliver ambient frequencies. Sometimes this can result in annoying vibration and low bass. That’s why the speakers need to be lifted up from the surface a bit. Well, the advantage of a good height doesn’t end here. 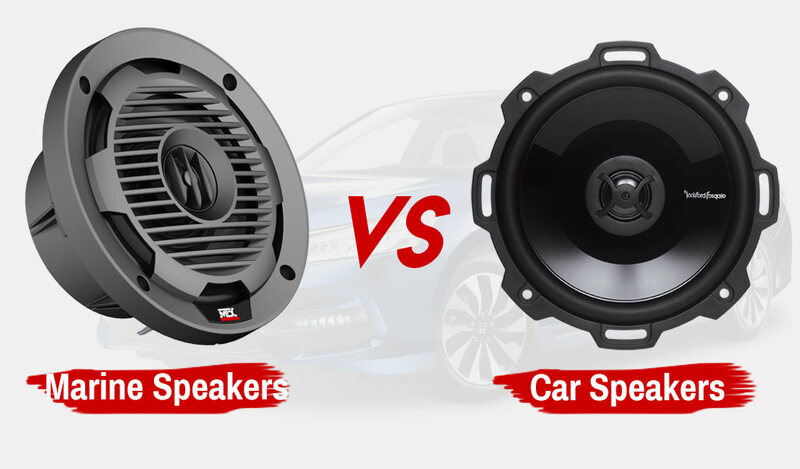 A speaker gives the best performance when its drivers are placed at an ideal hearing level. The height matters for that too. That is how we chose our candidates, selected the ones with good height or height adjusting privilege. That’s one of the foremost priorities when you’re looking for a durable item. The choice of material and construction method decide whether it’s gonna be long-lasting or not. And obviously we don’t want to bring a fragile piece home. We observed the construction and chose durable speaker stands only. Well, price differs with the piece, no argument on that one. But we also care about our customer’s convenience and we want them to have the best quality speaker stand within a rational price. We enlisted ten speaker stands in the list below that are rationally priced and include great features that are totally worth the cost. The foremost concern. The stand is actually intended to give the voice the speaker supposed to have in the first place but somehow can’t because of an ill placement. And this utility was our main concern while seeking for the best. We looked at the features and observed the privileges the stand is offering for sound. We selected the speaker stands based on their arrangement for ambient sound. Well, placement is a very important thing to consider here. For the speaker’s security, stability is a big concern. But the problem is, some surfaces are not that friendly. So, it won’t be a good idea to buy just any speaker randomly. Because it’ll be a total loss if the stand isn’t stable on the floor. This is the reason why we chose the speaker stands with helpful features for standing on random surfaces. For example, some stands feature spikes for carpets. The speaker stand is mostly about the loading capacity. It’s gotta have a good grip to handle the speaker accurately, right? So, we observed the following stand’s carrying capacity and that helped us to select the ten speaker stands below. The following speaker stands have loading capacity differences. Some of those speaker stands are built to carry small surround speakers. Some are even capable of holding heavy stereo. Well, there are different sorts of speakers available in the market. They vary in style, driver setup, wiring, size and other aspects. The model can change with the brand as well. So, the space required for a certain speaker may need some modifications and that’s when the issue of stand’s differences appears. Many times customers wonder, if their speaker will be compatible with the stand. Keeping that question in mind, we picked only those stands that are compatible with the most speakers regardless of the name/brand/model. Nothing is out of error. We admit, not everything is perfect and we believe our customers are concerned enough to differ between the right and the wrong. When we were selecting items, our target was to bring out some speaker stands that are brilliant at what they do. And you know, every item has some special sides or features which make them the best in general. Yes, that’s right. We’re talking about the stands’ pros. We inspected the pros they hold and sorted the items according to them. Because if those pros are what you’re exactly looking for, definitely they’ll give you the stand you were seeking all along. And one more thing, we also gave the glitches (cons) the similar priority, so that you can have a clear idea about what you’re dealing with. Because if you are okay with the cons, the deal will automatically turn in your favor. Frankly speaking, SANUS VuePoint HTBS Adjustable Height Speaker Stand is everything a standard satellite speaker stand should be and that’s why it’s undoubtedly one of the best speakers in current market. So, why it’s one of the best? SANUS VuePoint HTBS Adjustable Height Speaker Stand gives you the privilege of adjusting stand’s height and bring the speaker to the optimum hearing level. You can position the stand on the level of 28″-38″ from the floor for the best sound experience. 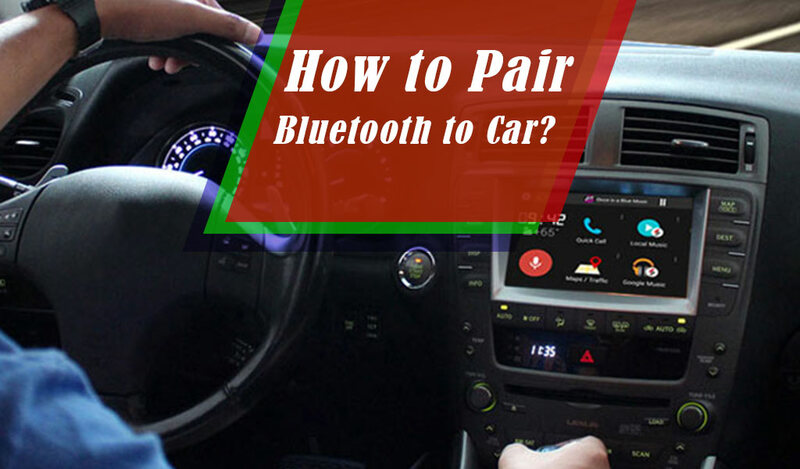 To get the premium level ambient sound delivery, the speakers can be placed at ear-level. You can also lift or lower the speaker and enjoy the pleasant sound. SANUS VuePoint HTBS Adjustable Height Speaker Stand is built with convenient plates and brackets to fit greater portions of satellite speakers. You can place the speaker directly on the featured top plates. Adhesive back pads are included to secure speakers firmly on the plate, specially the speakers that don’t include any bottom threaded insert for attachment. The stand also features L-bracket for the speakers with threaded insert. Some speakers feature keyhole slots for installation. This stand has an arrangement for that as well. It comes with keyhole adapter to fit those speakers. 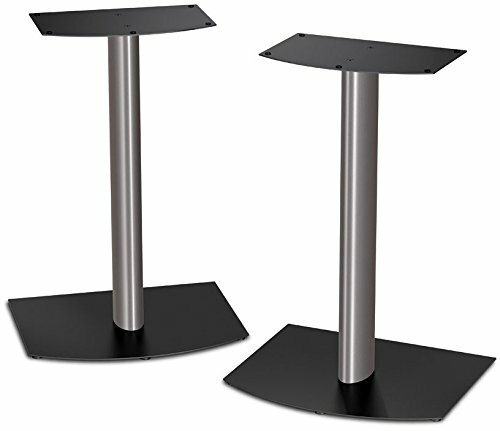 SANUS VuePoint HTBS Adjustable Height Speaker Stand is built with a rigid construction. Heavy-gauge steel has been used to ensure its proper stability. The stand can hold speakers up to 3.5 lbs. Doesn’t take much time to be assembled if it’s done with a Phillips screwdriver. Includes integrated wire channels. To get the best performance out of your satellite speaker today, SANUS VuePoint HTBS Adjustable Height Speaker Stand is definitely recommended and you shouldn’t hesitate to make the call. It lets you set the speakers at a convenient hearing level. Since it has plates, brackets and keyhole slots, so different types of speakers can be installed on the stand. Not suitable for heavy speakers. The wire-hole doesn’t fit all types of speaker wires. As it’s acclaimed in the market, Atlantic is ‘The Art of Organized Living’. They’re one of the famous global retailers of the market who are enchanting the customers from the beginning with astonishing convenient household solution to several demands and you can blindly rely on their products to fulfill your need. So why not an Atlantis speaker stand for instance? Atlantic Satellite 77305018 2 Speaker Stands give your speakers ‘the voice’ you want to hear. The stand’s height can be adjusted from 27 to 48 inches. You can use the height adjustment advantage for both surround and stereo sound. No compromise on durability. 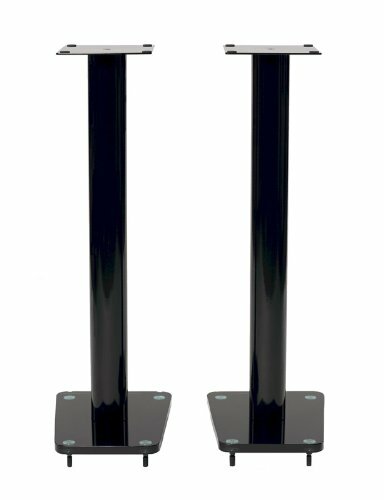 The speaker stand is constructed with black matte finish heavy duty cast iron structure. The featured wide base provides with the necessary support. The options of speaker is not limited. 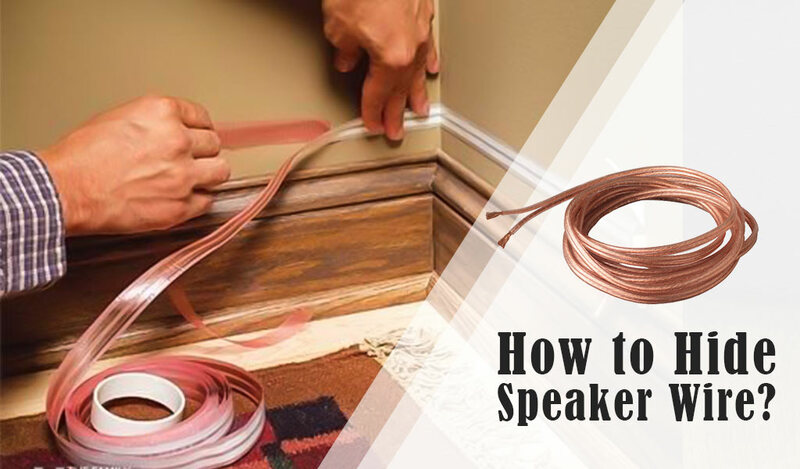 You can install differently designed speakers easily with the help of the brackets or the installation base it comes with as long as the speaker doesn’t weigh more than 5 lbs. 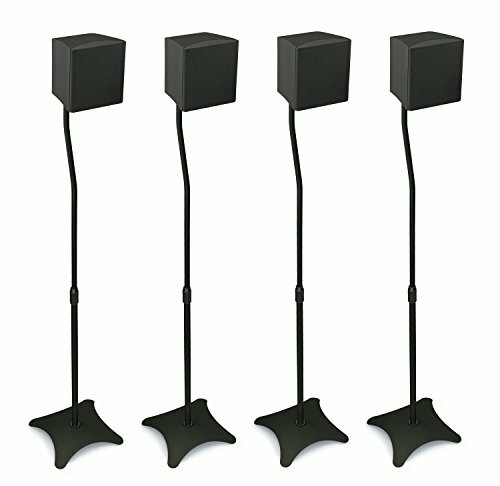 Atlantic Satellite 77305018 2 Speaker Stands come with a concealed wire path. This feature gives your speaker stand a neat attire. All thanks to the stable base for the most compact grip of the speakers; even then, the stand is pretty lightweight. Doesn’t take much of a hardwork for the assembly. A classic look with black matte finish when makes the piece artistic, all the features it contains makes the stand more than what one can bargain for. 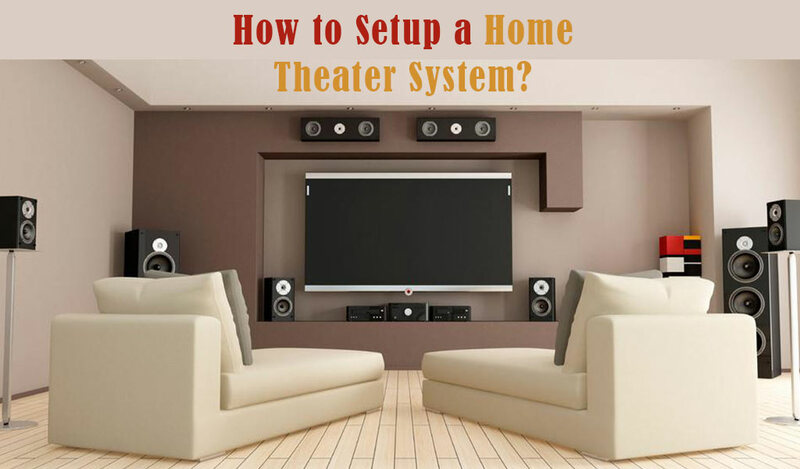 You’ll surely gonna love this fabulous addition to your home theater. 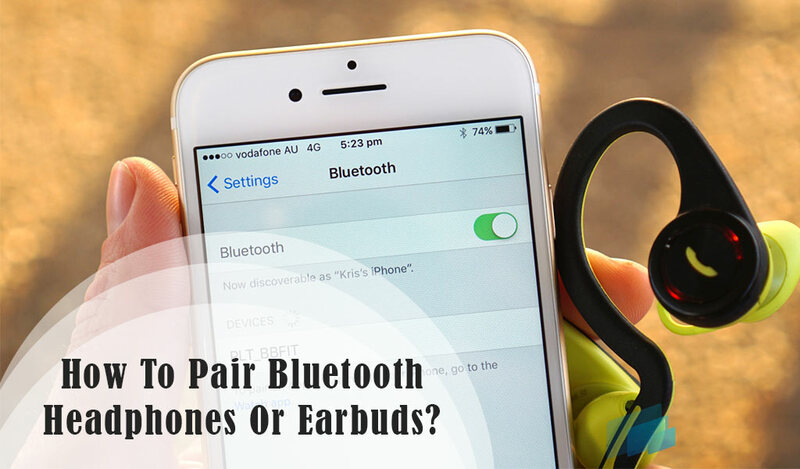 You can enjoy the perfect sound of both stereo and surround speakers. The height extends to a great point. Any standard styled speaker can be placed on the stand. Concealed wire path leaves no excuse for tangled wire on the floor. Not fit for all speakers. Can’t take the load of a heavier piece. 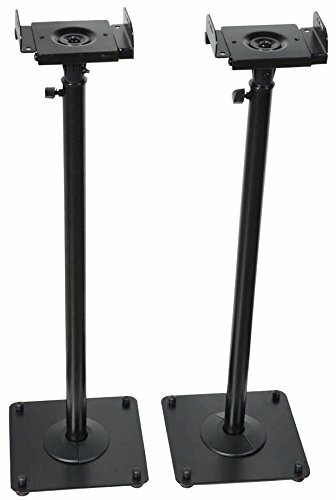 What can be better than a speaker stand that’s intended for basic stereo speaker placement only? A speaker stand that can go all the way around; surround standard stereo, bookshelf speaker, where speaker’s category doesn’t matter. 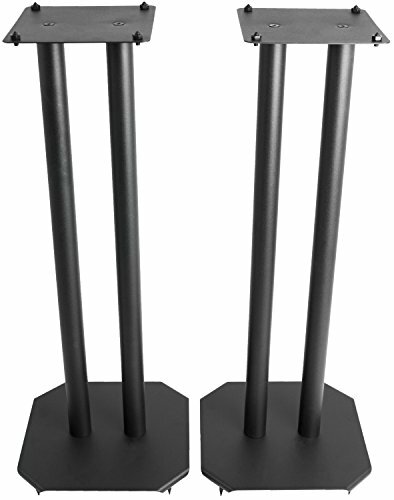 And VIVO Premium Universal Floor Speaker Stand (STAND-SP03B) is exactly that kind of speaker. In fact, it’s one of the best speaker stands for surround and bookshelf speakers. This stand is a compact piece and perfect for any place. You can rely on VIVO Premium Universal Floor Speaker Stand (STAND-SP03B) for long lasting service. High gauge cold rolled steel has been used to make the stand compact, sleek matte black finish brings life to the attire. Brilliantly designed for convenient placement. Included padded feet helps the stand to stay sturdy on solid floor, these feet are detachable. For carpets, the stand features carpet spikes. Those spikes provides this stand with a strong support to be upright on the carpet. As we already mentioned above, these stand can be eligibly used for several types of speakers as long as their weights are up to 22 lbs. It’s easy to find a quality stand that can carry standard stereo speakers or any small speaker, but a speaker stand that carries a bookshelf speaker, now that’s something unusual. And you can understand from inspecting the construction, it’s a tough deal. Definitely worth every buck. Padded feet and carpet spikes help in the stand’s firm establishment. The steel body ensures the product’s longevity. 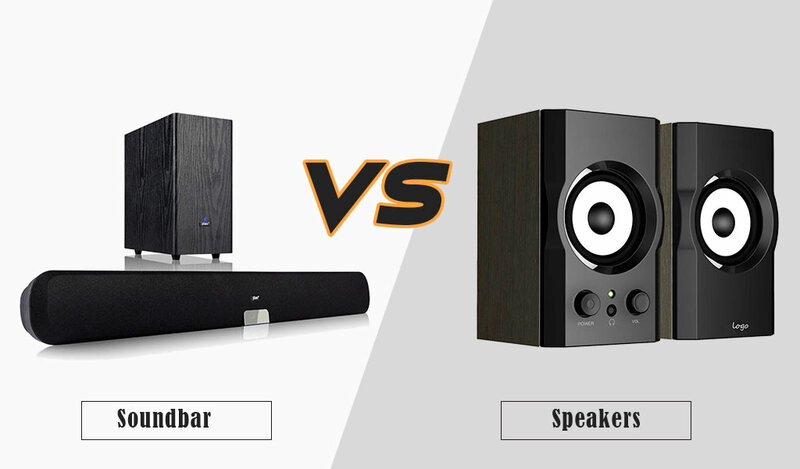 Satellite surround speakers can be a sole reason of headache if you don’t own the right stand. And the suffering is much more intense with big brands. Because big companies are always up to new designs and these types of modifications make it pretty harder to find a more suitable match. However, it’s not a problem when you have a speaker stand like VideoSecu Adjustable Height Satellite Speaker Stand. VideoSecu Adjustable Height Satellite Speaker Stand has given equal importance to both durability and decent outlook. The black matte finish steel structure has brought it the honor of classy outlook and sturdiness. The speaker stand’s height can be adjusted. You can raise the height from 26.5 inches to 47 inch. Adjust the speaker height and enjoy spot on sound. The top plate it comes with is adjustable as well. It’s a side clamping plate. Its width can be adjusted from 5.5 to 11 inches. You can either tilt or pan it to 180 degrees for proper adjustment. VideoSecu 2 Satellite Speaker Stand is pretty stable for all sorts of surface. It includes screw-in rubber feet that can stand stably on both hard solid and carpet wrapped floor. The stand features a hole in the brackets to conceal wires. It can hold weight up to 33 lbs. VideoSecu Adjustable Height Satellite Speaker Stand goes perfectly with major brand satellite surround speakers, its facilities are devoted to give you the service you desire for. Perhaps this is the one for you. Most speaker types fit perfectly with the stand. You can adjust the height and width to get to the convenient hearing level. It’s designed to stand stably on any surface regardless of its state. Wire concealment hole and black finish steel structure gives it a decent outlook. Have to be extra careful while fitting heavier speakers. Mount-It! MI-1214 5.1 Channel Surround Sound System Satellite Speaker Stand’s height can be adjusted from 26.8 inch to 43.3 inch. 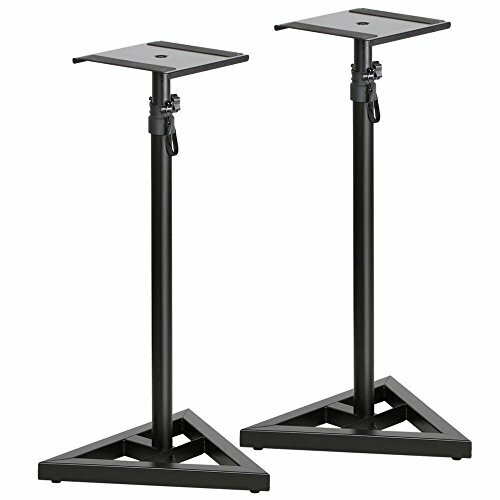 The speaker stand is constructed with heavy-gauge offset steel for durability and longevity. It features four heavy cast iron base legs that can stand stably on any surface, even on the carpets regardless of its thickness. This stand can support speakers weighing up to 5 lbs. Mount-It! MI-1214 5.1 Channel Surround Sound System Satellite Speaker Stand includes L-shaped brackets, top plate and keyhole adapter for speaker’s easy placement. Integrated wire channel is included for uninterrupted cable management through the pole, this system is pretty helpful for smooth installation of speaker. 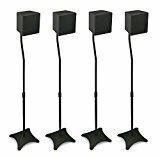 Comes in a set of four stands that helps in positioning an ideal home theater or surround sound system with proper management of front and rear speakers. Most types of speaker are compatible with the stand. So, here it is, Mount-It! MI-1214 5.1 Channel Surround Sound System Satellite Speaker Stand is one of the best speakers in the market and now you know why. Why not? It’s well-built, comes with decent facilities for convenient installation, includes sufficient features for proper hearing advantage – basically offers everything you want to see in a good speaker stand. The speaker can’t be installed if the mounting hole isn’t present on the back. 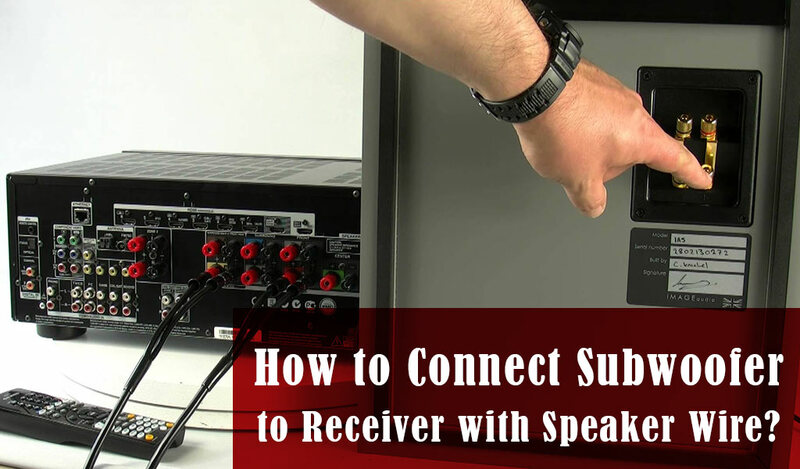 Cable pass through process isn’t eligible for the speakers with special connectors. If you own Bose 201 or Bose 301 bookshelf speakers, Bose FS-1 Bookshelf Speaker Floor Stand will definitely be the best chose for your home stereo. Well, it holds a green signal for other brands’ bookshelf speakers as well. So, what does it offer? Bose FS-1 Bookshelf Speaker Floor Stand provides with utmost durability which is evident from its construction. The speaker stand is built with compact material. Compact black steel has been used in top plate and base construction. The rest is rigidly wrapped with titanium-colored aluminum. 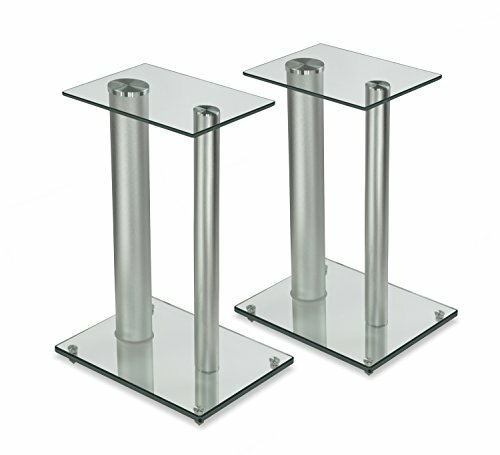 Bose FS-1 Bookshelf Speaker Floor Stand includes a top plate, a base plate and a support – three parts in total. The base plate features self-adhesive rubber feet that provides the stand with sufficient stability to remain upright on a decent surface. The top plate also has similar attribute for holding speakers: self-adhesive rubber bumper pads. The support is hollow. You can run the wire through it and get a neat setup. Yep, this is pretty much our boy, Bose FS-1 Bookshelf Speaker Floor Stand. Well, it’s intended for supporting Bose bookshelf speaker models particularly, but considering the rigid construction and all the other facilities, this certainly won’t be a problem if your bookshelf speaker is not a Bose speaker. 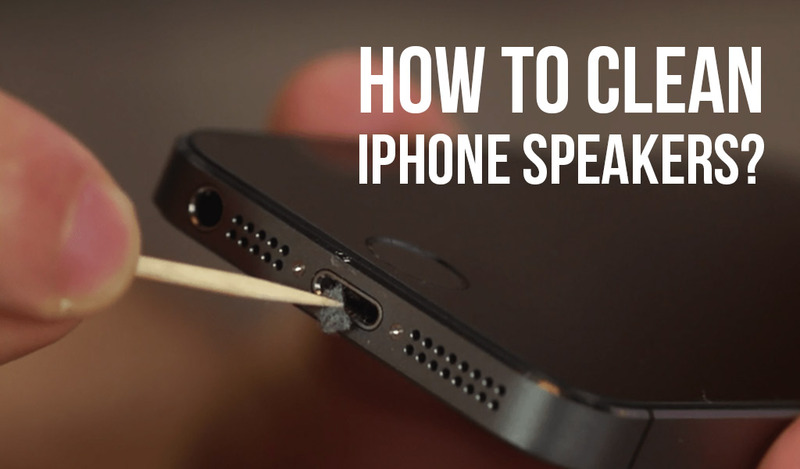 Speaker installation method is pretty simple. Features wide space for bigger speakers. Made for Bose bookshelf speakers, but goes with most types of speakers anyway. If you think, loads of greens have to be invested to own the best speaker stands, Ultimate Support JS-MS70 Stand might come as a shock to you. Ultimate Support’s JamStands series introduces tremendous combination of budget and quality through their stands and JS-MS70 is literally the proof of that. Ultimate Support JS-MS70 Stand’s height can be adjusted. You can adjust the stand to four different heights from 32.5 inches to 44.25 inches. For firm and stable adjustment, the stand features locking pin. Raise or lower the height, roll the pin and lock it to make the change stable. The whole JamStands series has been designed keeping the customer’s convenience in mind. That’s why they follow a low profile attire and the same has been applied on JS-MS70 as well. Ultimate Support JS-MS70 Stand features low profile base. Base’s low profile design makes it more stable to be positioned on a narrow or tight space. And this just doesn’t end here. The stand includes several types of equipment for placement on different types of surface. Levelling floor spikes are featured to place the stand on the carpet, rubber feet makes that easier on hard floor. So, Ultimate Support JS-MS70 Stand is a budget stand that may not seem fancy from the outlook, but will surely bring life to your sound system or home theater by providing with the best hearing level. Height can be adjusted; fits most types of speakers. Wide base boosts standing stability. Pretty heavy since the whole thing is solid metal. Heavier speakers can totter its stability. Speaking of the speaker stands, what makes a speaker stand the best in your perspective? Obviously a stand that does the ‘job of a speaker’ the best. And how do we define that? Basically, a speaker stand that gives the utmost privilege of bringing the sound to a convenient level is considered the ‘best speaker stand’ and everything a stand offers for such privilege is what makes it the best. And the same goes for Topeakmart Adjustable Monitor Triangle Pair Steel Stand as well. 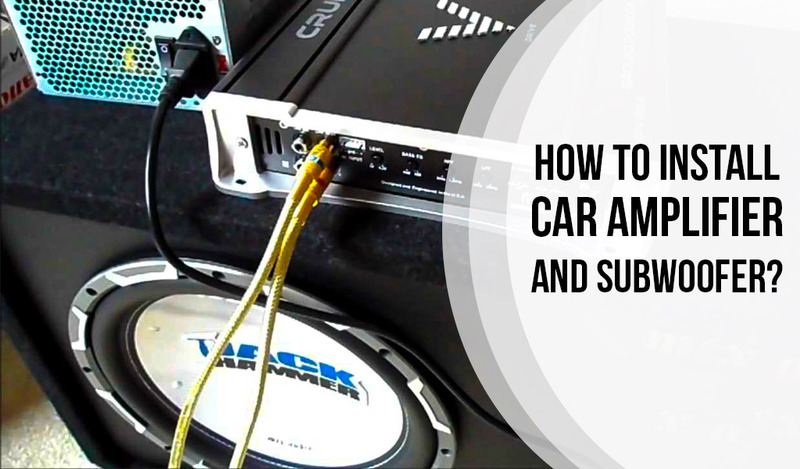 It’s not something fancy with radical features on the top and the bottom, but it offers all the basic things that’s enough for fulfilling a stereo system’s need. So, what does it hold? 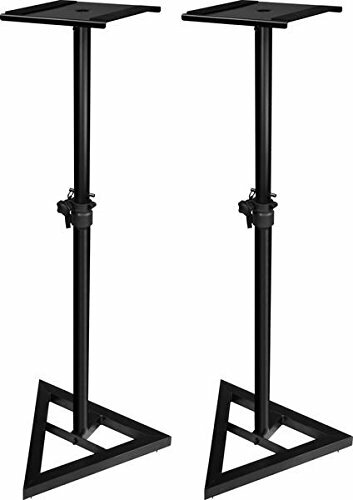 Topeakmart Adjustable Monitor Triangle Pair Steel Stand is an adjustable stand. You can adjust the height and take the speaker to a convenient hearing level easily. Durability matters a lot when it comes to the construction. And this speaker stand excells in this criteria as well. For compact body, A3 steel has been used in the stand manufacturing. The steel body makes the stand sturdy and ensures longevity. Generally, most speakers fail to carry larger weight and that limits your options for big speakers. Well, it’s not a problem for Topeakmart Adjustable Monitor Triangle Pair Steel Stand. The stand can hold up to 40kgs. In brief, Topeakmart Adjustable Monitor Triangle Pair Steel Stand is indeed a good investment of money considering the features. It’s well built, capable of rising the speaker to a convenient level and speaker weight isn’t much of a problem – a good deal in a rational cost. Height can be adjusted to get to a convenient level. Sturdy and compact body as well as long-lasting. Can’t stand on all sorts of surfaces. Beauty and divine performance: when these two qualities are immersed together, a speaker stand is bound to become one of the top quality speaker stands. And this is exactly why we enlisted TransDeco Speaker Stand here in the first place. TransDeco Speaker Stand is a 32-inch long speaker stand, which will surely add more elegance to your current system with its captivating beauty and construction. The stand is basically built with heavy gauge steel to ensure sturdiness and longevity. The steel body has been given high gloss black finish. Tempered glass with beveled edges has been added to intensify the outlook with more divinity. TransDeco Speaker Stand has been also pretty careful about the speaker’s protection. Soft pad is featured to protect the speaker from external damages. Well, the stand is quite stable on an even surface, but what about uneven surface? To get rid of this problem, TransDeco Speaker Stand includes spike feet. These spike feet are adjustable and brings a balance between the stand and the uneven surface you’re intending to put it on. The spike feet also helps in reducing sound distortion. It includes built-in wire management system, so pile of wire getting on your way and causing trouble won’t be a problem anymore. Now, after seeing all the features, you can pretty much understand what you’re dealing with here. And you can also understand why it is recommended. TransDeco Speaker Stand is a durable stand with helpful facilities and classy outlook: the appealing combination everybody wants in their speaker stands. It’s a splendid deal that should not be refused. Featured spike feet boost speaker’s sound quality along with helping to stand on an uneven surface. The speaker doesn’t get easily affected because of the included soft pad for protection. Wire management system reduces wire tangling problem. Have to be assembled manually and takes a little time for that. Though sturdy body, you gotta be extra careful about glass. Another Mount-It! franchise. Can’t help, they’ve got some really captivating deals, and Mount-It! 2 Satellite Speaker Stand for Surround Sound Home Theaters is one among all of their best speaker stands. Mount-It! 2 Satellite Speaker Stands are indeed built for Surround Sound Home Theaters, so you can pretty much assume what to expect. Mount-It! Satellite Speaker Stand is 18 inch long which makes it a perfect choice for the speaker’s placement on an ideal height. The stand consists of a base, a pole and a top shelf. The pole is built with aluminum to provide sturdiness and longevity. The aluminum pole is coated with silver. 0.5 inch thick tempered glass is added on the top shelf. For convenient placement on all types of surface, it features spikes and rubber pads. Spikes are added for carpet or similar surface, and rubber pad makes the stand more stable on solid floor. The aluminum pole is made hollow for wire management privilege. You can run the wire through the pole and conceal it. The stand can handle weight up to 22lbs. So, that’s been said. Mount-It! 2 Satellite Speaker Stands for Surround Sound Home Theaters are also promising candidates just like every other popular Mount-It! item. Order today and complete your home theater. You can conceal wire by hiding it inside the hollow pole. The stand can be placed on any type of surface. Have to be extra careful about the glass shelf. 1. What if the stand’s height is not adjustable? Ans: This is not a problem if the stand is tall enough. 2. What is the ideal height of a non-adjustable stand? Ans: It depends on the place of your use. 3. What kind of speaker can be placed on a stand? Ans: It depends on the stand’s features. Some stands are simple and are built for lightweight or small speakers only. On the other hand, there are stands that are particularly built for heavy speakers. A few stands are manufactured particularly for bookshelf speakers or specific stereo speakers. 4. What features are mandatory in a speaker stand? Ans: Convenient height, a stable base, a strong shelf to carry the speaker and enough space for reducing vibration. 5. 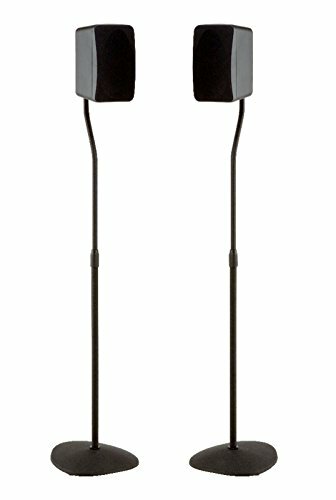 Are the speaker stands above compatible with all sorts of speakers? Ans: We put different types of stands on the list. If we see all round, these stands go with the most types of speakers in general. However, they’re indirectly intended for surround speaker usage. Well, if you’re reading this already, it’s pretty obvious that your quest has been fulfilled. We hope that our suggestions, buying guide and tips were helpful enough. Till we meet again, have a great day!